The ultimate in Iron Free technology, with best-in-class "Out of Dryer" freshness that smoothes wrinkles and keeps colors truer longer, even after regular washing. These feature a hook and bar front closure for refined style, plus a coin pocket and double welt button-through back pockets. 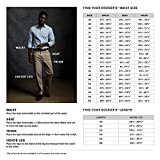 Interested in the Dockers Men's Classic Fit Iron-Free Khaki Pant D3 Flat Front Stretch, Dark Wheat, 42W x 30L? Is the price too high? You can easily price watch this product and we'll notify you when the price reaches your target.